This three day youth workshop combined native science, western science and the arts to explore the universe. The workshop was part of the STEMarts@The Paseo Youth Program and took place at the Taos Day School as our first inter-school collaboration with TISA (Taos Integrated School of the Arts). In this workshop we brought together native and western world views through art. The goal was to expose students to radical new science concepts in the field of particle physics while emphasizing the importance of indigenous cosmology and storytelling as an integrated worldview. Twenty two 5th and 6th grade students from the Taos Pueblo Day School and five “teen leads” from TISA who had taken the workshop before participated in the sci-art experience. 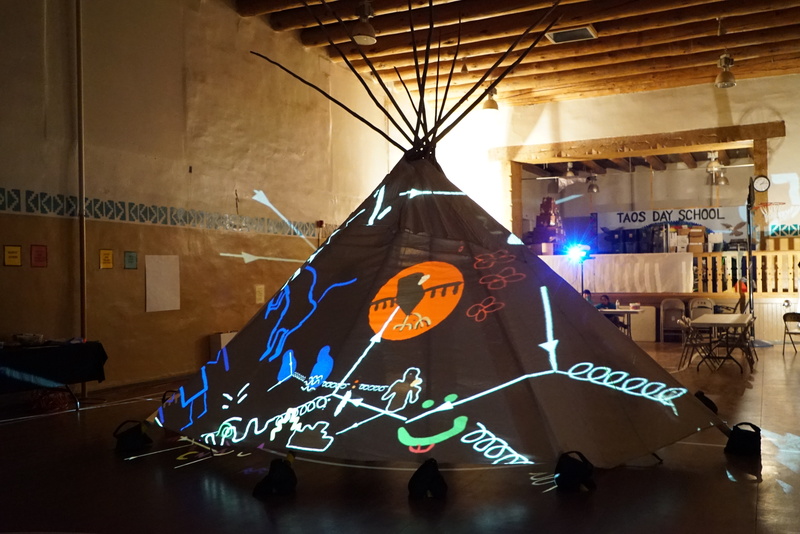 The workshop culminated with a tipi projection installation in the gym of the Taos Day School and the final tipi installation will be shown again for The PASEO festival on September 14, 15, 2018. Through a virtual visit with CERN physicist, Dr. Steven Goldfarb, students learned about the Large Hadron Collider, the largest particle accelerator in Geneva Switzerland and how it is used to discover particles that are key to our understanding of the universe. Shane Wood, physics teacher and Quarknet fellow lead the hands-on physics activities developed by Quarknet. Nicole Lloyd- Ronning, an astrophysicist at Los Alamos National Lab made a guest visit to deepen student understanding of the cosmos through a hands on activity exploring Feynman diagrams. 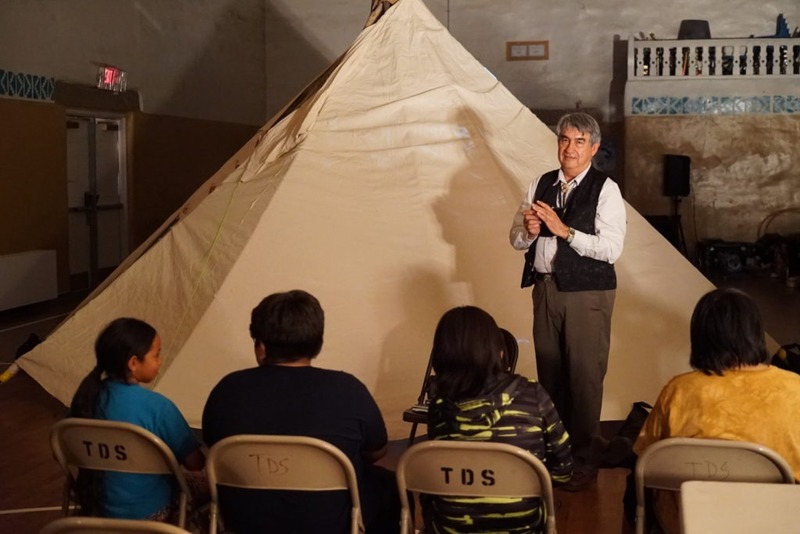 Lakota cultural specialist, Steve Tamayo, led the building of a Lakota Tipi, weaving of a dreamcatcher in the tipi and told stories that through metaphor explored the cosmological observations through traditional arts practices. The students created Feynman diagrams combined with petroglyph-inspired symbols which they painted on hide. They participated in opening and closing ceremonies. Dr. Greg Cajete visited the classroom to share stories from different tribes. In the workshop students were encouraged to artistically explore their unique cultural perspectives. Guided by the curriculum research of Dr. Greg Cajete and his book, Native Science: Natural Laws of Interdependence, we encouraged youth to imagine a new worldview that combines the advances of the scientific method and technological innovations with a life-sustaining ecology that is participatory and in balance with nature. New Media Art and Technology. Students learned to use an iPad animation tool called Tagtool to express their new understandings about the universe. New media artist, Agnes Chavez taught the kids Tagtool to transfer their newly created stories into animated electronic projections. They learned to design creations for the parent performance and had a hand at live painting on the tipi. Tagtool and projection art added a fun and innovative tool to explore. TISA students had the experience of teaching what they had learned from past Tagtool workshops, demonstrating animation techniques, file saving and projection tools. It was an opportunity for these students to hone their leadership skills. This led to great learning experiences for both schools and as a result we plan to coordinate regular inter-school activities to continue to develop those bonds. TISA lent their projectors and iPads to Taos Day School and Megan Avina Bowers, Arts Coordinator and 5th grade teacher at TISA participated in the curriculum development and workshop overseeing the engagement of TISA students. Marilyn Trujillo and Leroy Martinez provided feedback and insights for improving the continued collaboration and we are all looking forward to future inter-school activities. 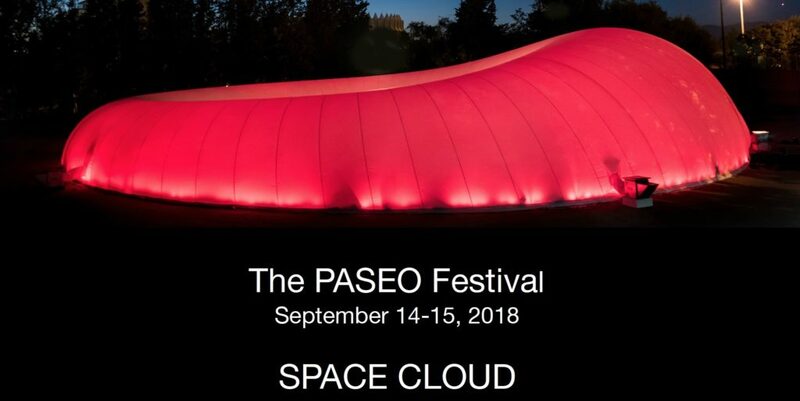 On September 13, 14, 15 a small group of the workshop students from Taos Day School and TISA will gather gather to assist the Paseo artist/teachers in putting up the tipi installation with student work for The PASEO festival and for the pre-festival PASEO Youth Day in the Space Cloud. Students will learn to be part of an international production for a festival and they will perform with Steve Tamayo as he engages the audience in making a Dreamcatcher inside the tipi. This Paseo workshop was sponsored by the LANL Foundation in partnership with Taos Integrated School of the Arts, Quarknet, ATLAS Experiment at CERN and The Paseo Project.